Haojie Lian obtained Phd Degree in Cardiff University in 2015, in the supervision of Professor Stephane Bordas. The Phd project focus on the shape optimisation integrating with CAD. 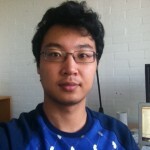 Now Haojie is a Postdoc in TopOpt group in Technical University of Denmark. The research objective is to combine topology and shape optimisation for fluid-structure problems.